But about halfway through that arc there was a moment when it was not inconceivable that the story might suddenly end. With many major leaguers, including future Hall of Famers like Ted Williams and Bob Feller, going into the service for World War II; and some minor leagues folding altogether; professional baseball’s future was thrown into doubt. The game was saved by a new group of ballplayers who met in Illinois and created a league like the nation had never seen before. In 1943, Cubs owner Philip K. Wrigley put together a committee to come up with solutions to the crisis facing the national pastime. Among the ideas they developed was the notion of bringing in players from existing women’s softball leagues and creating a women’s league to play in Major League Baseball stadiums around the country. Dodgers President Branch Rickey and other business and baseball leaders came on board, and in 1943 the All American Girls Softball League was formed. 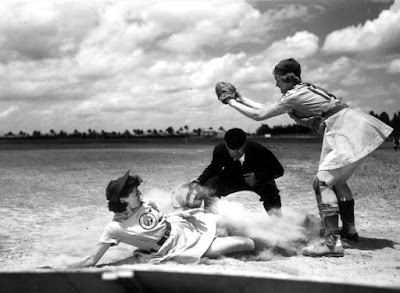 By the end of the first season, the league had changed its name to the All American Girls Professional Ball League (AAGPBL). The game initially was a merger of baseball and softball, with a larger ball and underhand pitching, but with longer distances between bases and baserunners allowed to lead off and steal. Over time, the rules would evolve more toward baseball. Longtime Cubs scout Jim Hamilton was charged with scouring the nation for the best women’s softball players, while his counterpart, Johnny Gottselig, a former hockey star with the Chicago Blackhawks, did the same in Canada. They put together a group of 280 players who tried out for the first teams in the league. That first season featured a total of 60 players on four teams. At 15, Bensenville native Audrey Wagner was one of the youngest players in the league. By this time, the idea of a nationwide league playing in Major League stadiums had been discarded in favor of a smaller regional league which would play in mid-sized cities around Chicago. When spring training for the league commenced at Wrigley Field on May 17, 1943, players were assigned to their teams: the South Bend Blue Sox, Kenosha Comets, Racine Belles and Rockford Peaches. Teams were added the next year in Milwaukee and Minneapolis. The 108-game season began in Rockford, with the Peaches hosting South Bend on May 30, 1943 at Beyer Stadium. During the inaugural season, the four teams would draw attendance of 176,612, defying some expectations. In the championship series at the end of the year, Racine beat Kenosha to become the first champions of the AAGPBL. Rockford’s Gladys “Terrie” Davis led the league in hitting in that first season with an average of .332. Pitcher Olive Little threw the first no-hitter in league history, one of the 21 games she won for the Peaches in 1943. As with all elements of American life during the war years, the AAGPBL was heavily influenced by support for the war effort. Instead of standing along the baselines for the national anthem before each game, players arranged themselves into a V-for-Victory formation on the field. Teams played exhibition games to help raise funds for the Red Cross, and would make visits to wounded soldiers in area hospitals. But perhaps nothing better exemplifies the way in which the league reflected the spirit of a nation carrying on in spite of the terrible tragedy of war better than the story of Milwaukee catcher Dorothy “Mickey” McAlpin Maguire. Just before a game on June 10, 1944, Maguire received a phone call informing her that her husband, Thomas, had been killed while fighting in Italy. Determined not to let her teammates down, Maguire suited up for that night’s game anyway and got a hit. Maguire was known as one of the toughest players in the league, called “indestructible” by some of her teammates. It was only after the game that she shared the tragic news. 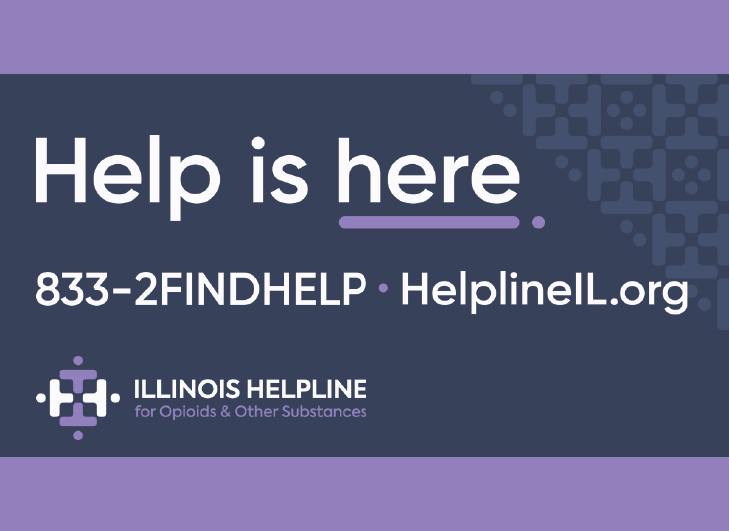 Happily, it was later determined that the devastating phone call she had received had been a mistake: her husband, though wounded, was still alive and returned home months later. The league caught on in a big way as spectators came to realize the quality and skill of the players on the field. By 1944, the four original franchises had become successful enough that local boosters agreed to pick up their financing. Illinois once again hosted spring training that year, on the ball diamonds in the city of Peru. With World War II approaching its conclusion in 1945, it became clear that Major League Baseball was no longer under threat of shutdown, and Wrigley sold his interest in the league to advertising executive Arthur Meyerhoff. Meyerhoff restructured the league and paved the way for more expansion. He also did away with a requirement that players attend charm school sessions. Attendance approached half a million fans in 1945, and Rockford won its first league championship. In 1946, Rockford’s Dorothy “Kammie” Kamenshek won the league batting title with a .316 average. She also played in the all-star game at first base, where she was generally recognized as the best in the league during a career which spanned almost the entire history of the AAGPBL. She repeated as batting champ in 1947. More Illinois teams became part of the AAGPBL after the war. The Peoria Redwings started play in 1946 and the Springfield Sallies and Chicago Colleens in 1948. Though the league never expanded outside the upper Midwest, its teams traveled around the nation, playing games in such famous venues as Washington’s Griffith Stadium and Yankee Stadium in New York. In 1948, the league hit its peak attendance, drawing 910,000 fans to its ten ballparks. That same year, Rockford began a run of three consecutive championships. Behind the pitching of Lois “Flash” Florreich and her league-leading 22-7 record in 1949, Rockford outdueled South Bend for the title. 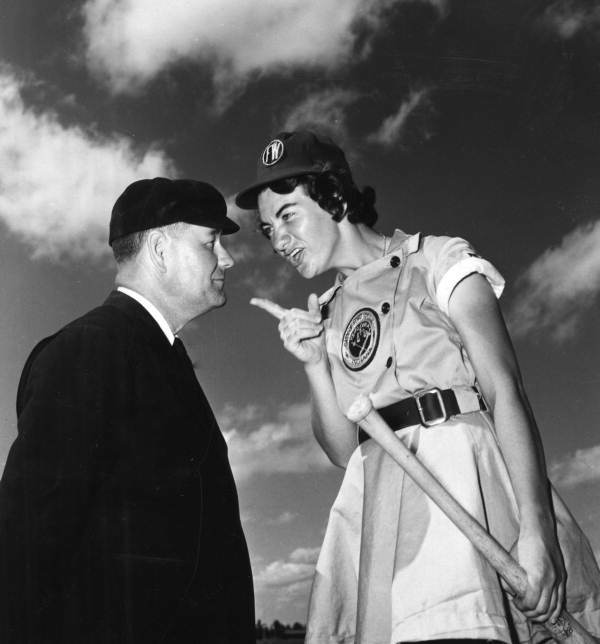 In 1950, Rockford won its third straight title (their fourth overall), while Betty “Fossey” Foss of Metropolis, Illinois, won the league batting title for the Fort Wayne Daisies. Her sister, Jo, was the league’s Player of the Year in 1953 and 1954, hitting .429 and bashing 29 home runs in her final season, setting single-season records in both categories. She had the highest career batting average of anyone in the league at .359. Dottie Schroeder of Sadorus, Illinois, played in each of the league’s 12 seasons. Her best season came in 1954 when she hit .304 with 17 home runs for the Kalamazoo Lassies. Schroeder was also known as a superb fielder. Cubs manager Charlie Grimm reportedly mulled offering her a $50,000 contract to play for the Cubs. But by the early 1950s, the league began to decline. Financial difficulties caused individual teams to struggle. The advent of televised Major League Baseball games hurt the AAGPBL and many of the other leagues in the nation, men’s and women’s alike. In 1954, down to just five teams, the league folded. The Rockford Peaches were one of only two teams to play in every season of the league’s run. More than 100 women from Illinois played in the AAGPBL. 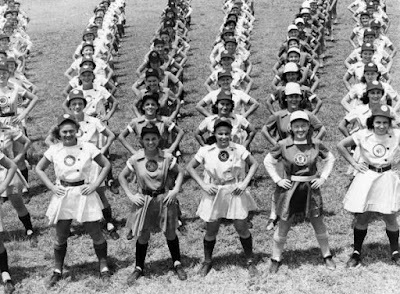 Though AAGPBL veterans continued playing into the mid-50s, and other leagues came and went, none quite captured the attention that the AAGPBL had. Over the next few decades, the league began to fade from the national consciousness, but not entirely. A players’ reunion in Chicago in 1982 helped rekindle interest in the league. 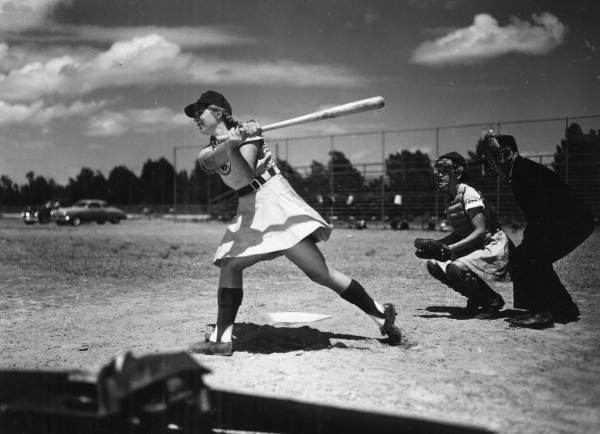 In 1988, the National Baseball Hall of Fame and Museum in Cooperstown, New York, opened its “Diamond Dreams: Women in Baseball” exhibit, highlighting the history of the AAGPBL and other women’s leagues over the years. Four years later, the AAGPBL was brought back to life on the big screen with the release of the movie “A League of Their Own,” starring Geena Davis, Madonna and Tom Hanks. The film follows a fictionalized version of the Rockford Peaches through the 1943 season. Last October, the Peaches’ old stadium hosted a tournament for players ages 9-18, billed as “the largest girls-only baseball tournament in the world.” Today, women from Illinois play collegiate and professional sports at world-class levels, winning national championships and gold medals. The long history of women’s sports in America didn’t begin here, but one of its most important chapters centers around a group of women who got together in Illinois during World War II and helped save the national pastime.